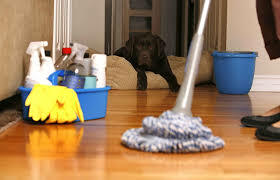 One of the most important tasks a home care aide has is to keep their client’s house clean. A clean and hygienic home is the best place for patients to recuperate and recover from their illness. Dirty and unkempt homes create breeding grounds for germs and bacteria, and are also depressing to a recovering patient. Cluttered homes also pose serious tripping and falling hazards for patients with mobility problems and need to be avoided at all costs. Furthermore, the more untidy and disorganized a home is, the more time a home care aide will spend trying to put it to rights instead of devoting that valuable time to looking after the client. With this in mind, you can appreciate the importance of making the home easy to clean and maintain, whether you are the owner, patient or home care worker. Fortunately, this can be accomplished with the help of these three handy tips. Furniture brings a home to life. However, you might have to change a few things in order to make the house easier to clean. For starters, you need to decide on the type of covers you want your furniture to have, mostly the chairs, seats or sofas – these are the most used furniture in the house and are likely to get stained often. For easy home maintenance, opt to dress furniture in slipcovers. These are available in several designs to suit the home’s interior décor. Machine-washable slipcovers come with added convenience as they can be quickly popped in the washer if they get stains. While it may be impossible to change the type of flooring or windows in a home, you can dress them differently to ease their cleaning. Carpet tiles are a good alternative to full wall-to-wall carpets. They come in a variety of textures and are easy to vacuum. If one section gets heavily stained, it can be removed, washed and replaced without removing the whole carpet. When it comes to dressing the windows, opt for window shutters instead of curtains. The former are simple to install and save time when it comes to cleaning. All you need is a duster or a soft cloth and some water and they are clean in no time. Some areas in a home are naturally prone to accumulating clutter. Creative storage solutions are therefore required. Consider acquiring furniture with in-built storage to combat clutter. Items such as window seats, ottomans and footstools with hidden storage compartments are perfect for stashing away books, magazines, toys and other items. For additional convenience, put storage near the place where items to be stored are usually used. This will save you the hassle of going halfway round a room or house looking for items you need. Finally, remember that small changes such as adjusting the home’s layout and furniture arrangement can make it easier for everyone to move around. Keeping everyone’s comfort in mind will go a long way towards easing the cleaning load, ensuring that home patients are given the maximum care they deserve. 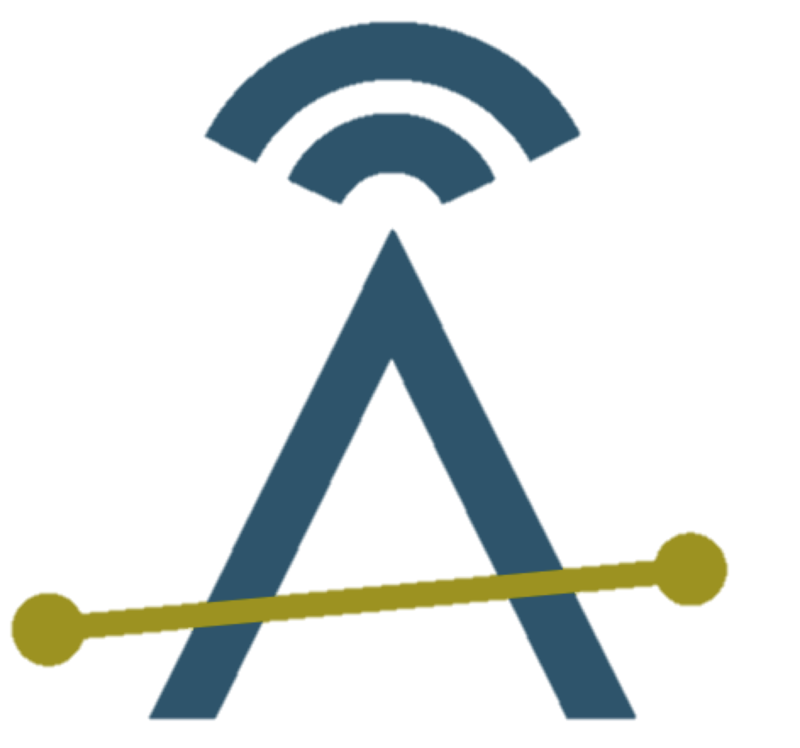 Article contributed by Luke Simone. Ankota provides healthcare management software. 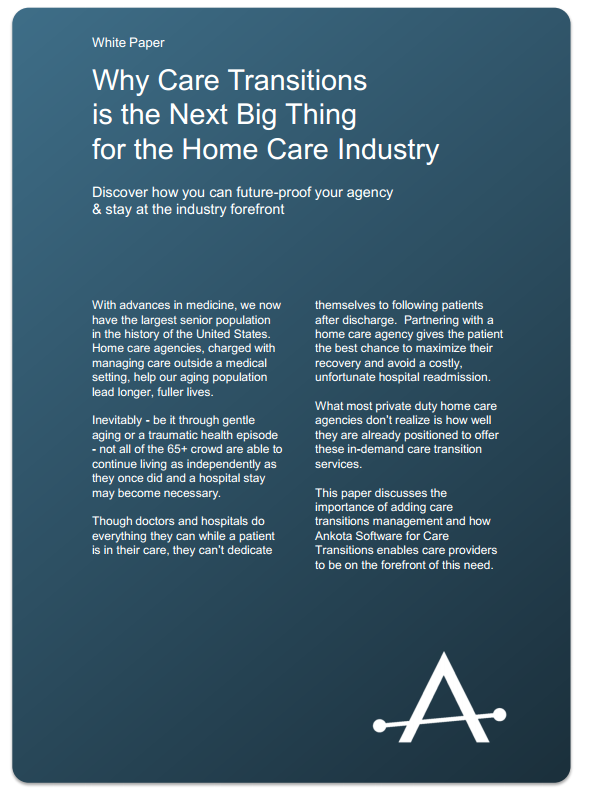 If you'd like to learn more about our software for home care and care transitions, click here for a demo or click the following link to download our latest white paper, "Why Care Transitions is the Next Big Thing for the Home Care Industry." Ankota provides software to improve the delivery of care outside the hospital, focusing on efficiency and care coordination. Ankota's primary focus is on Care Transitions for Readmission avoidance and on management of Private Duty non-medical home care. To learn more, please visit www.ankota.com or contact us .